I now give you the fourth installment of this story. I have made a slight addition to the last post and will provide it before the new section. “Rise, hunter, and take this blessing.” The priestess, dressed in a slave’s rags, lets the luminous orb fall from her hands and land on Richard. He stands and faces the darkness. Before them countless bones litter the forest floor. Femurs split in half, marred with savage scars from the monster’s grinding fangs, remnants of crushed skulls, broken for their tender brains, and bloodied rags of shredded clothes adorn the cave’s entrance, memories of those taken. A resounding howl bellows from the entrance, as if the pair stands before the gapping mouth of some snoring giant. Under his feet the dried bones roll and slide. Like treacherous river rocks that may drop a wanderer into the sweeping current the hapless remains of murdered farmers shift beneath their avenger’s steps. Deep claw marks penetrate the cave’s wall, drawn across a strange etching. The hunter spares it a glance, judging the possible size of the abomination which had so quickly retreated down the hill. The marks cut through the image of a canine’s snarling face. Drawing closer, the light emanating from the hunter illuminates further carvings. Surrounding the wolf head like a wheel, differing scenes show two struggling figures. One, the hunched wolf, the other, an erect man. The topmost scene has the two squaring off, but the next picture shows the wolf leaping into the air. The man falls under the predator and is replaced by a skeleton. Then a spearman comes behind the wolf. Its crouching form turns and leaps, but this time it is skewered upon the hunter’s weapon. The hunter stands victorious holding its arms to heaven. But then a small circle appears, the sign of the red moon. The man falls to the ground, but then it is not a man. The wheel starts over with the wolf and the man facing each other. Richard sticks his hand into a claw mark, measuring how deeply they go. The tip of his finger disappears, almost up to the first knuckle. 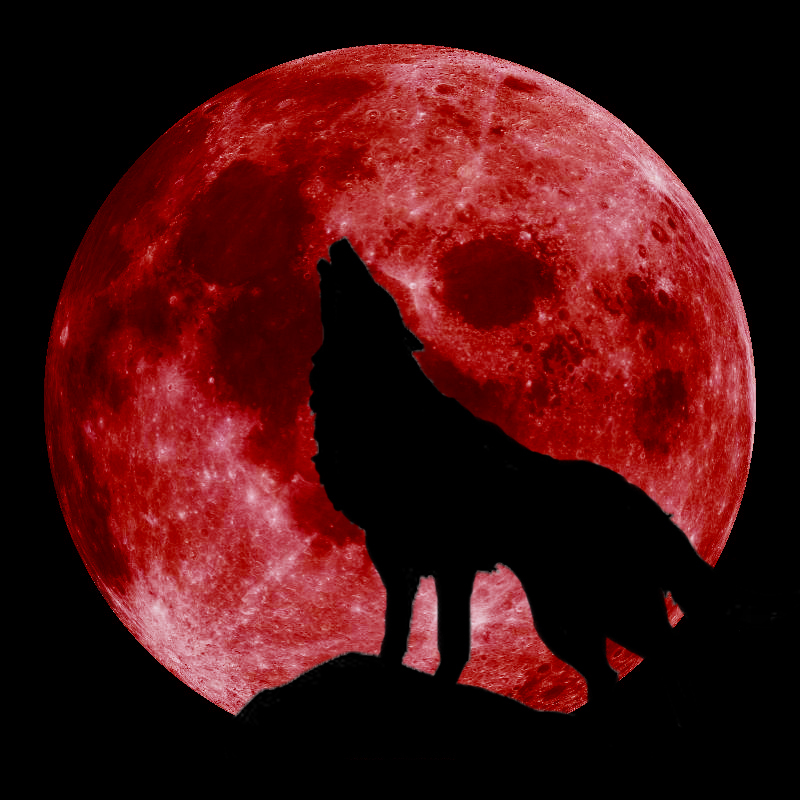 A howl fills the chamber like a flood and breaks the hunter’s study. His weapon is up in a moment staring down the dark tunnel. The bones wane as he progresses until the floor beneath him is barren. The further in the wider the cave walls part until not even the priestess’s blessing reveals them. The hunter stops, enfolded in deep darkness. Before him barefooted running quietly echoes like the sound of leather beaten by a rode. Out of the darkness a pale blinded creature springs. Its hairless white skin glistening in the hunter’s glow, its sticky sweat shinning in the sunlight. Immediately the visitor drops to the ground. Richard aims at the naked creature as it convulses on the cave-floor holding its hands up to its face. Vaguely human in form, the shriveled man scrambles on all fours back into the black void. The hunter’s eyes follow the creature’s retreat, and sees where its cowering shape rests. The thing turns and sits at the perimeter of the light. Barely, the hunter can make out where this stranger hides, but, peering, he sees another groveling figure next to it. He begins to hear a soft clamoring all about him. A chorus of chirping squeaking sounds, like song-birds crossed with mice, surrounds him. To the left more shadowy figures lie, and all about a mob of these blind men corral the hunter. Slowly he puts a foot forward and the creatures part before the radiant circle of light. Step by step the hunter progresses into the cavern’s night, accompanied by the barefooted sounds of hundreds of mutated cave dwellers. His stalkers chirp and squeak to each other in their shadows. The abomination’s howl shakes the very earth so that soft mounds of overhead dirt rain upon the floor. The cave dwellers scatter in a fury of scampering squeaks growing quieter and quieter until the hunter stands alone in the desolate darkness. He feels a stickiness under his feet. Looking down, the hunter notices his foot resting over the abomination’s crimson paw print. A bloody trail of them cut across the path, leading to his right. Turning, the hunter follows the tracks, baring the crossbow before him.